Frequency Stability Analysis Program from the IEEE UFFC web site. As of December 22, 2017, ownership of the Stable32 program has been transferred to the IEEE UFFC-S where it is now freely available. Hamilton Technical Services no longer sells Stable32. Support for the commercial Version 1.61 of Stable32 will continue for one year after purchase. No support will be provided for the free Version 1.62. General Information General information about Hamilton Technical Services. 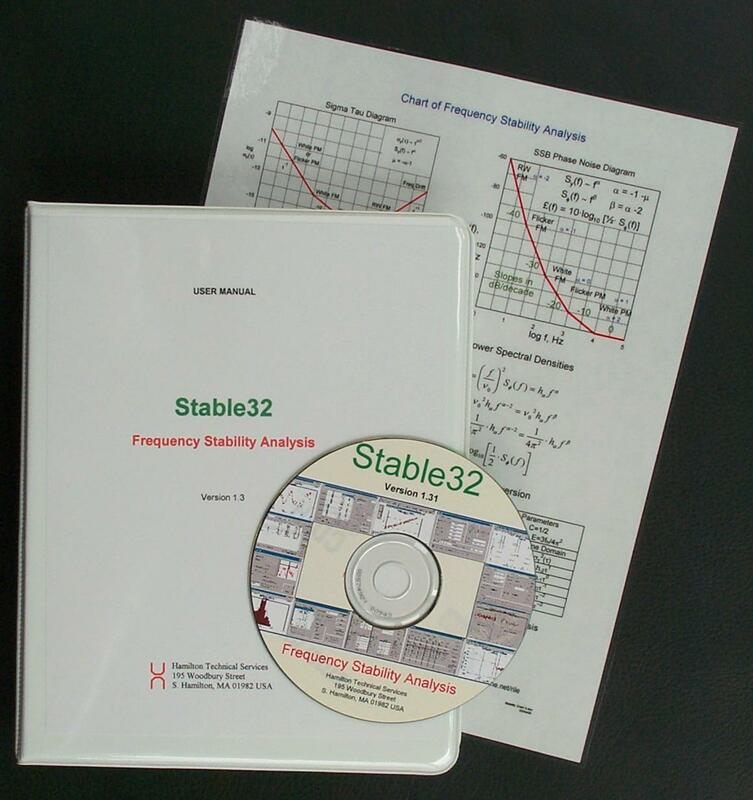 Stable32 Program Information about the Stable32 program for frequency stability analysis. Papers and Documentation On-line papers about frequency stability measurements and analysis. Data Test data for frequency stability analysis. Software and Documentation Information about Stable32 and other software and its documentation. Links Links to other web sites with time and frequency information. Contact Information How to contact us. Hamilton Technical Services developed and sold the Stable program for frequency stability analysis from 1982 until 2017 when it was donated to the Institute of Electrical and Electronic Engineers (IEEE) Ultrasonics, Ferroelectrics and Frequency Control Society (UFFC-S) for free distribution to the time and frequency community. This web page continues to provide information about the Stable32 program, test data files, on-line papers providing information about frequency stability analysis, and links to other sites involving precise time and frequency control. Stable32, a full-featured Windows® program that provides all the functions needed to perform analysis of frequency stability data. Click on the link at the top of this page to download a free copy of the program. Click on the links below to obtain a Stable32 data sheet and/or brochure for it. Please ignore all pricing and ordering information. Click on the following link to take a virtual tour of the Stable32 program. The current free version of Stable32 is Version 1.62 of 11/10/16. See the Stable32 User Manual and its Version 1.62 User Manual Addendum file for more information. If you have an earlier version of Stable32 and wish to update to the current version, please download it from the IEEE UFFC web site using the link at the top of this page. Support for Stable32 from Hamilton Technical Services has ended except for licensees of Version 1.61 who bought it during 2017 for whom support continues until one year after their purchase. The Stable32 User Manual may be downloaded as an Adobe PDF document. This is an electronic version of the printed book below. A printed version of the Stable32 User Manual is available for purchase. A free MJD/DOY calendar utility for Windows 95 and above is available for downloading. Click on the link below to download the file 22MJDate.exe to a working directory on your hard disk, and then run it to install the MJDate program.